Wherever you go with your Ergo you'll know it's well protected in an Odyssey Flight Ready® Case. 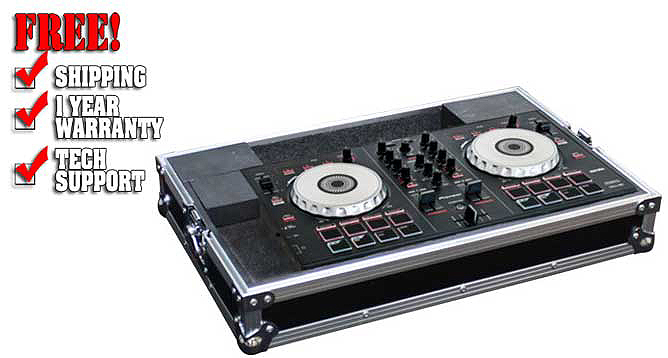 The Flight Ready® FRERGO is specifically designed to hold not only the popular Pioneer DDJ-ERGO digital DJ controller equipped with Virtual DJ LE software (also compatible with other DJ software such as Traktor), it also holds and protects your valuable laptop safely under the controller! With the strong strategically placed hook and loop straps, foam padding on either side, and an addition adjustable foam layer, you can guarantee that your laptop will stay secure in place. When you're ready to perform, just unstrap your laptop, connect all the necessary cables flip up the screen and position it at the rear of the Ergo and rock the crowd with the keyboard underneath as envisioned by Pioneer all the while with both the controller and laptop inside the case. Other features include a front removable V-cut™ panel panel for easy access to the front input jacks and enough rear interior space for cables and power supplies. Also available in the Black Label™ series (FRERGOBL).